Published: Feb. 21, 2014 at 01:33 p.m. 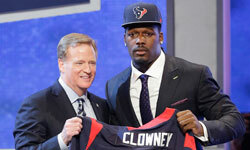 Updated: Feb. 21, 2014 at 03:23 p.m.
INDIANAPOLIS -- Set to count more than $14 million against the salary cap, Matt Schaub is widely believed to be history in Houston. We believe it's just a matter of time before the 32-year-old quarterback is released, but new Texans coach Bill O'Brien wasn't ready to concede that -- or much of anything -- on Friday. O'Brien told Around The League that he's huddled one-on-one with Schaub for a "good conversation," but O'Brien isn't ready to make a decision on the passer's fate during a "dead period" in the league calendar. "We're always going to do what's best for our team," O'Brien said. "What's best for our team are competitive players, hard-working guys that buy into our program, that are good teammates, that really perform well on the field. That's what we're looking for." Asked by ESPN.com's Tania Ganguli if Schaub exhibits those traits, O'Brien acknowledged that he didn't have enough information, saying: "There's different stages to the process. You don't get to know someone during a dead period." Cutting Schaub would save Houston just $4 million against the cap, but his departure makes plenty of sense for a team looking to start over at the position. Young Case Keenum has a better shot to stick around, costing just $495,000 in 2014 and described by O'Brien on Friday as "athletic, competitive, smart" and a "good team guy." But is Keenum an NFL starter? O'Brien paused for what seemed like a lifetime, before telling us: " ... We'll see."